When the sun goes down, light and shadow become the sole instruments of design. 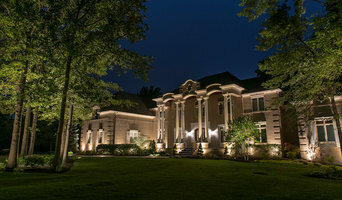 Outdoor lighting design should define space, direct the eyes, sooth emotions, and invite you in. Let us show you why the most inviting, enchanting, and beautiful time for your outdoor home can happen at night. Unlike most of our competition, (as you will find here), we are not a division of a landscape or irrigation company nor are we a national franchise. Outdoor lighting is our sole focus and passion and we are not beholden to certain product lines or franchise parameters. We serve only Central Ohio. Lighthouse of Columbus is an outdoor lighting installation and design company that creates amazing outdoor living experiences. What services do Columbus outdoor audio and visual system professionals provide? Home theaters are moving outdoors, too. Sports fans can grill without missing the game, and families can invite neighborhood friends over for movie nights. Special weatherized flat-screen TVs are coated to minimize glare. Imagine your Columbus, OH backyard with a custom-designed outdoor theater system — complete with a large projection screen. It makes backyard entertaining easy. Find outdoor audio and visual system professionals on Houzz. Look in Houzz’s Professionals section to find Columbus, OH outdoor audio and visual system experts. Narrow your search to the nearest city or metro area for a list of nearby businesses. Get contact information, read reviews and look at completed Ohio custom outdoor sound system projects.